J.S. Helwig & Son now hiring Company Drivers in the Chatham, IL area! 47CPM at the start with an average of 2800+ miles/week! J.S. Helwig & Son now hiring Company Drivers in the Lancaster, OH area! 47CPM at the start with an average of 2800+ miles/week! J.S. Helwig & Son now hiring Owner Operators in theBlanchard, OK area! $1.40 per mile plus fuel surcharge! J.S. Helwig & Son now hiring Company Drivers in the Woonsocket, RI area! 47CPM at the start with an average of 2800+ miles/week! J.S. Helwig & Son now hiring Company Drivers in the Harrisburg, PA area! 47CPM at the start with an average of 2800+ miles/week! J.S. Helwig & Son now hiring Company Drivers in the Buckland, MA area! 47CPM at the start with an average of 2800+ miles/week! J.S. Helwig & Son now hiring Owner Operators in theFairforest, SC area! $1.40 per mile plus fuel surcharge! J.S. Helwig & Son now hiring Owner Operators in theBrewster, NY area! $1.40 per mile plus fuel surcharge! J.S. Helwig & Son now hiring Owner Operators in theStanley, NC area! $1.40 per mile plus fuel surcharge! J.S. 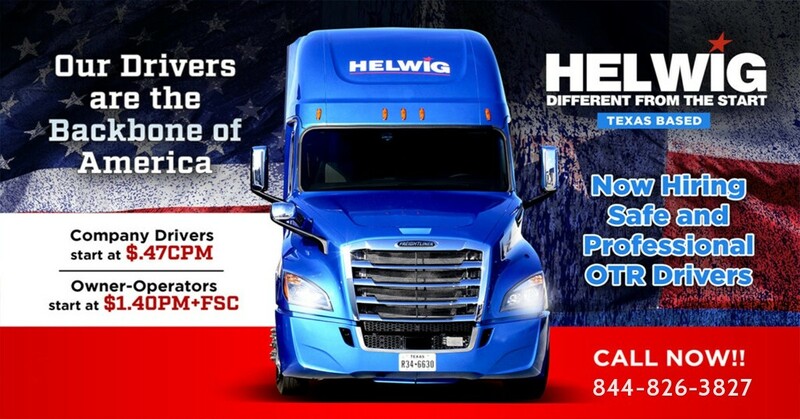 Helwig & Son now hiring Owner Operators in theHeflin, AL area! $1.40 per mile plus fuel surcharge! J.S. Helwig & Son, LLC. is a Common and Contract Carrier. We serve customers of temperature controlled and time sensitive traffic with safe and efficient transportation, servicing the contiguous 48 states. All of our employees are dedicated to customer satisfaction and superior service. In 1984, we began with 15 power units. Since then our primary goals has been on-time delivery, on-time pick-up, and consistent communication with our customers. Our commitment to excellence in these areas has enabled us to grow to our present size, and accounts for 99.5% on-time performance. This achievement is also due to partnership relationships with our customers, modern equipment, and the most up-to-date technology. Our operation utilizes solo, team, and owner operators, which offers flexibility to adjust to our customer’s needs. All of our employees are trained and motivated to provide excellent customer service and a safe operation to enhance our productivity. J.S. Helwig & Son, LLC. believes it is the collective and the individual efforts of our employees that make us a superior service company. Our employees are encouraged to come forward to present their views and ideas, and our management team is available to listen and respond.